As a Lansing senior parent ages and his or her body starts to slow and break down, the need for prescription medicines will likely increase. Keeping track of multiple medicines and all that comes with that (dose amounts and times, side effects, contraindications, interactions, etc.) takes significant time and effort. The stakes are also high: improperly taking medications can have serious consequences for anyone’s health, but especially for a senior. To stay safe, read our recommendations below and know that it never hurts to enlist some help. Bring your list of medications to your provider (you might bring along patient information leaflets to be safe) and ask him or her to review for potential hazards, such as a medication or dosage that’s inappropriate for your Lansing senior parent’s age, or dangerous interactions with other medications (or even herbal supplements). It never hurts to get a second opinion, so a pharmacist should look the list over, too. Pill reminders help ensure a Lansing senior parent never misses or doubles a dose. They come in a variety of formats, such as telephone reminder services and specialized alarm clocks. There are also a slew of apps you can download to your parent’s smartphone if he or she has one (as well as your own for safe measure). 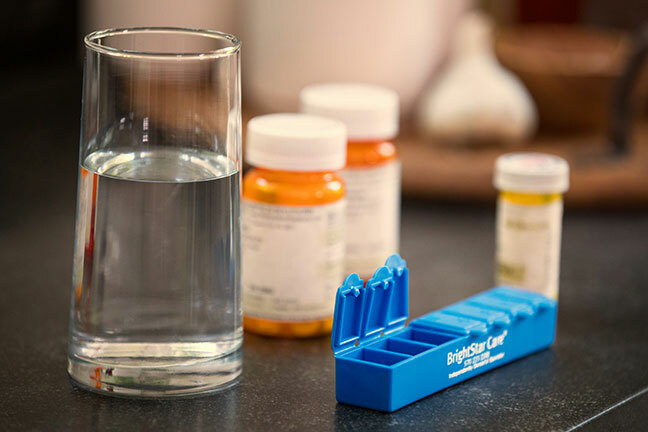 Lansing seniors with Alzheimer’s or another form of dementia or cognitive impairment should not be allowed to take their medication on their own. The danger of missing a dose, confusing pills, or even overdosing is too high. In these cases, an in-home caregiver or family member should oversee medication management. Also know that some medicines may create side effects that mimic cognitive impairment—another good reason to keep a list of medicines current.